If we’re about to go on a walk or run, we’ll find our most comfortable and supportive pair of shoes to wear, or a pair of heavy duty boots if the roads are particularly treacherous. Our dogs, on the other hand, are equipped with just the one set of paws to transport them over every surface, albeit mud, ice and snow, and can’t pull on a different set when conditions and climate demands it. Therefore, it is essential that your dog’s paws are well looked after as they have a very important job to perform. Not only are they your dog’s support, they provide traction and shock absorption which protects the bones and joints, allowing your dog to live life to the fullest. So what should you be thinking about when it comes to paw care? 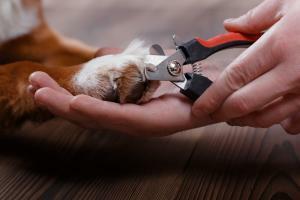 Trimming – it is easy to overlook your dog’s claws and forget to keep an eye on how long they’re getting, but if you do, you’ll soon find them snagging or hear the click click of nails scraping the floor. You also need to look out for hair between the toes, as this can get painfully matted if it isn’t tended to. If you don’t feel comfortable doing this yourself, ask your vet to help you. It is very important that you avoid the quick and use the right type (and size!) of clippers, so it is worth getting your vet’s advice the first time round. Alternatively, you can see a pet groomer who will trim and file the nails for you, remove dirt and debris, and generally spruce up the paws. Moisturise – you might think this is something reserved purely for humans, but dogs need their paws moisturised often, especially in winter when exposure to cold weather causes the pads to become dry and cracked. A paw butter containing oatmeal, coconut oil and aloe vera will help soften the pads and soothe minor irritation. Look out for moisturisers specially designed for dogs and use liberally after a walk once you have rinsed away the mud and ice (some de-icers are toxic to dogs so it is important that they don’t get chance to lick them off). You can also apply Vaseline or paw wax before the walk to protect the paws from grit, salt and anti-freeze on the paths. Boots – sometimes no amount of paw wax is enough and you need to introduce a physical barrier such as a paw boot or shoe. These are often sold individually so you can protect as many paws as necessary and are ergonomically designed to be comfortable, secure, non-slip and waterproof. Paw boots are particularly good for older, arthritic pets that struggle getting about and need a bit of added grip and support. Practice first aid – it’s a good idea to have a well-stocked first aid kit to hand in case of an emergency, as it is not unusual for a dog to obtain the occasional cut or scratch when out and about, so save time and have the necessary things all in one place. Of course, if the injury is more serious, head straight to the vet for treatment. Although they’re often overlooked, your dog’s paws are some of its most valuable assets, so do all you can to protect them and help your dog stay sound and mobile for many years to come! Hannah thank you for the really informative items on your blogs. I've just read the one about looking after pet's paws. You write in the first para that a dog only 'has one pair of paws' and 'cant pull on a different pair'. Two legged dogs do exist, poor things, but most have two pairs of paws. Perhaps 'a set of paws' gives a less worrying image? Keep up with educating us, it is very useful for all pet owners. Thank you.